Top medieval sculptures from the Museum of Fine Arts in Dijon, in Burgundy, France travel the USA for temporary exhibitions in top American museums and galleries. The mourners from the tombs of the Dukes of Burgundy, usually on display in Dijon, France, are traveling the USA for much of 2010 to 2012. These statues, considered to be amongst the best late-medieval sculptures in France, will be on display in New York, St. Louis, Dallas, Minneapolis, Los Angeles, San Francisco, and Richmond before returning to Dijon via Paris. The mourners from the ducal tombs are usually on display in the Musée des Beaux Arts (Museum of Fine Arts) in Dijon but will tour through North America while the museum is being renovated. The mourners from the tombs of the Dukes of Burgundy are considered some of the finest late medieval sculptures in France. During the fourteenth and fifteenth centuries, Burgundy was one of the most powerful entities in Europe and the dukes even challenged the kings of France for supremacy in the French-speaking world. The two dukes of Burgundy, Philip the Bold (Philippe II le Hardi – 1363-1404) and John the Fearless (Jean II sans Peur – 1404-1419) represent the high point of Burgundy’s political and military power. Their tombs, originally on display in the choir of the chartreuse de Champmol in the western suburbs of modern-day Dijon, similarly represent the highpoint of art in the ducal court of Burgundy. Following the French Revolution, the chartreuses were secularized and the tombs have been on display in the Musée des Beaux-Arts (Museum of Fine Arts) in Dijon. The mourners from the Burgundian ducal tombs are individually-carved alabaster figures. They are placed on the side of the tombs, with life-size sculptures of the dukes and their wives on top of the actual tombs. The around 16-inch (40-cm) high mourners sculptures were carved by Jean de La Huerta and Antoine Le Moiturier between 1443 and 1470. 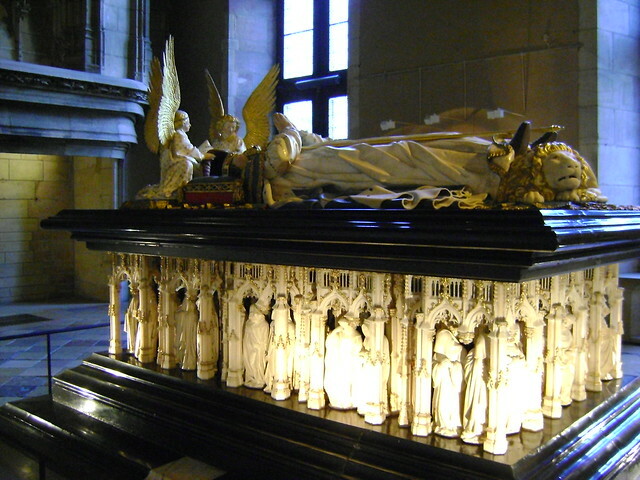 The mourners that will tour the USA are the 39 statues from the tomb of the second duke of Burgundy, John the Fearless. During the American tour, the mourners from the tombs of John’s father, Duke Philip the Bold, will remain in France. Similarly the actual tombs will remain in place in the museum but under covers until renovation work is completed in 2013. Admission to the Museum of Fine Arts in Dijon, Burgundy is free – unfortunately, the same will not be the case for the temporary exhibitions in the USA. The individual museums will set their own opening hours and ticket prices. Burgundy is in the geographical heart of France and a popular tourist destination. It is most famous for its wines but also has beautiful nature and picturesque, medieval towns. Some sights worth exploring in Burgundy apart from Dijon include the UNESCO World Cultural Heritage-listed Abbaye de Fontenay Abbey, medieval Semur-en-Auxois and Flavigny-sur-Ozerain (the setting for Chocolat), and Chateau Clos de Vougeot (head quarters of the Chevaliers du Tastevin) on the Grands Crus wine route.